For every online survey you complete with Panel Champ, you will be rewarded with cash. No points systems to worry about – the amount of compensation offered per survey will be stated in the e-mail invitation you receive. Survey topics range from politics, to world issues, to music surveys, and typically take around 10 minutes to complete. When your account reaches the low minimum balance of $12.50, you can request a payment to your PayPal account. Panel Champ frequently offers music rating surveys which are very lucrative; although payouts can be as high as $90 per completion, most are offered at between $1-$10 for around 10 minutes of your time. Helpful Tip! Get fewer disqualifications by completing the profile survey available in your account. Panel Champ is run by Quest Global Research Group which is a Canadian company based out of Oakville, Ontario. Since 2003, they have been conducting surveys all over the world and they have panels available in USA, Europe, Australia, Asia, and more. It’s a very quick process to join Panel Champ as a survey taker. Fill out the short registration form (available by clicking the “join now” links on this page) and then confirm your e-mail address by clicking the link in the e-mail which Panel Champ will then send out to you. 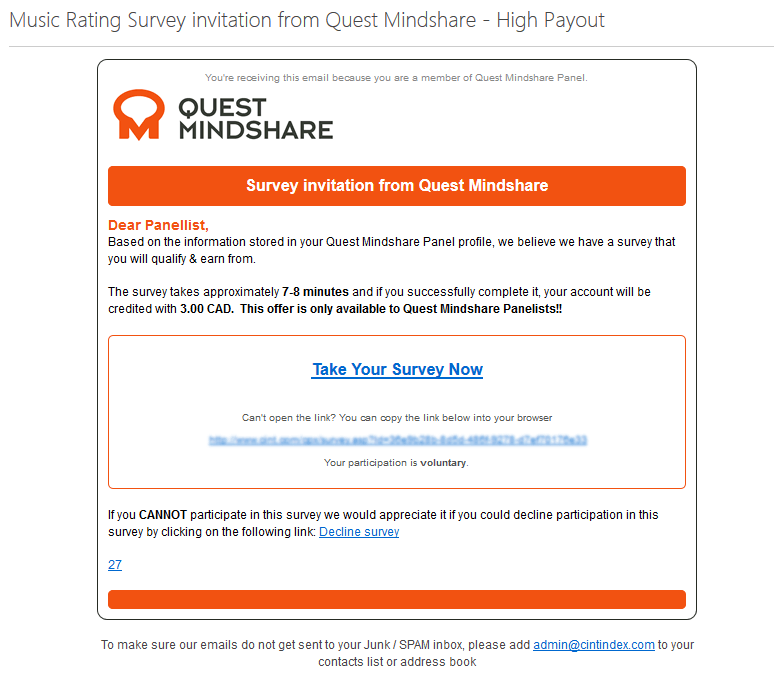 Monitor your e-mail for online survey notifications, especially the music survey ones! Each survey will state the topic of the study and will list the financial remuneration for your completion of it. It is always your choice whether or not you choose to complete the survey – it is never mandatory nor a requirement for anything.